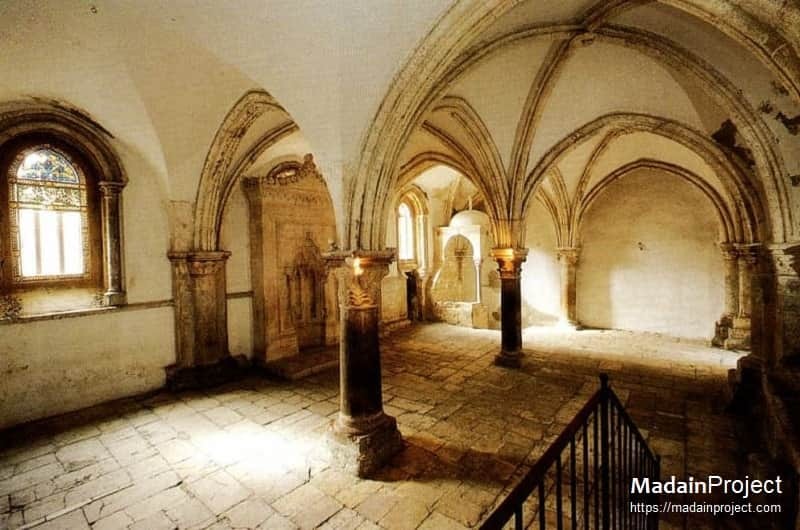 The Cenacle (from Latin cēnāculum "dining room", later spelt coenaculum and semantically drifting towards "upper room"), also known as the "Upper Room", is a room in Jerusalem traditionally held to be the site of the Last Supper. Looking southwards, the architectural evidence remains of the period of Muslim control including the elaborate mihrab in the Last Supper room, the Arabic inscriptions on its walls, the qubba over the stairwell, and the minaret and dome atop the roof. The stairs, in the Last Supper Rooom, leading down to the cenotaph chamber topped with a samll dome with crusader era column depicting pelicans. The capitals of the freestanding columns are not identical. The capital between the first and second bays seems either severely weathered or shallowly carved, and its volume is a marked contrast from the others. Analysis of these column capitals does not yield significant evidence to link them to the 14th century and a potential Franciscan construction, nor does it definitively date them to the 12th or 13th century.